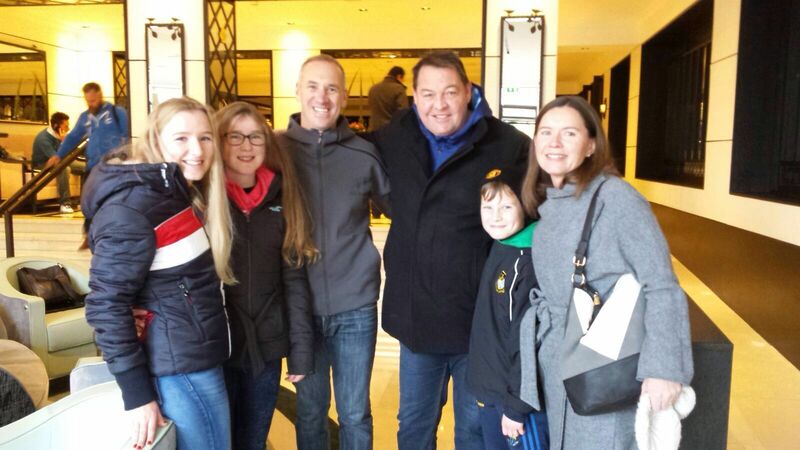 Longford Head Coach, Glenn Baskett and Family with All Black Head Coach Steve Hansen. One big development for the coming season is that all games will have full video analysis with players and the team receiving collective and individual feedback. Glenn is also long term friends with Ex-All Black Coach Wayne Smith, as a mentor over the years he is invaluable, and who he is in regular contact with and who provides feedback for the team and Glenn. As well as providing insight to the inner workings of a high performance environment. Finally, Glenn has been working with renowned Sports Psychologist Jason Brennan on the mental side of the game. Brennan recently brought out a great book called ‘Win’ in conjunction with rugby pundit, Brent Pope, on mental skills for rugby and life, which is highly recommended. Longford Senior Men train every Tuesday and Friday night at 7.45 PM with Leinster League Matches normally on a Sunday. If you are interested in playing for Longford or would like more information please give Director of Rugby Niall Moran a ring on 087 9185073.